If you’ve read the MarketingExperiments Blog for any length of time, you know that A/B testing and conversion optimization can be a very profitable endeavor. You can receive 90% more trial sign-ups, a 1,312% increase in the start rate of a multistep process, 331% more leads from a homepage, and the list can go on and on. Aside from improving results, the sociologist in me finds it fun to create a few possible headlines or subject lines, release them into the world, and see how customers react. I’m not alone. For example, when Amelia Showalter, Director of Digital Analytics, Obama for America, discussed the A/B testing that helped generate $500 million in online donations for the president’s re-election campaign, she mentioned the fun the analytics and email teams had as well. They asked the teams which subject lines being tested would win, and which would lose. At MarketingExperiments, we’ve been known to have a little fun with surprising test results as well, thanks to a very gracious CEO. Online marketing can be a tough daily slog in the trenches, so to help you have a little fun with A/B testing, we’ve thrown down a challenge to the readers at Copyblogger. We’ve said you, the dear readers of the MarketingExperiments Blog, are not only smarter, more fun to be around, and more physically attractive than the readers of Copyblogger – you are more effective subject line writers, thanks to all you’ve learned from A/B testing. If you scroll down, you’ll see the exact copy of an email we are going to send promoting MarketingSherpa Email Summit 2014 in Las Vegas. We’re asking you to write the best subject line you can think of, and leave it as a comment for this blog post. Then, the MECLABS optimization team will read each and every comment and hand-pick the five subject lines they hypothesize will perform best. Copyblogger’s team will also pick five subject lines from its blog as well. We’ll then run all 10 of those subject lines in a split test. The writer of the subject line that generates the most unique clickthroughs will receive a complimentary ticket to Email Summit 2014. We’ll even put you up in the host hotel, the Aria Resort & Casino, for two nights. The writer of the subject line that receives the highest open rate (CTR is our primary KPI, or key performance indicator, but opens will be a secondary KPI), will receive complimentary access to the MECLABS Email Messaging Online Course. If you’re the type of marketer that likes diving into the details, you can read the official rules. Sound like fun? Great, let’s see what you’ve got. Below is the email we will be sending. 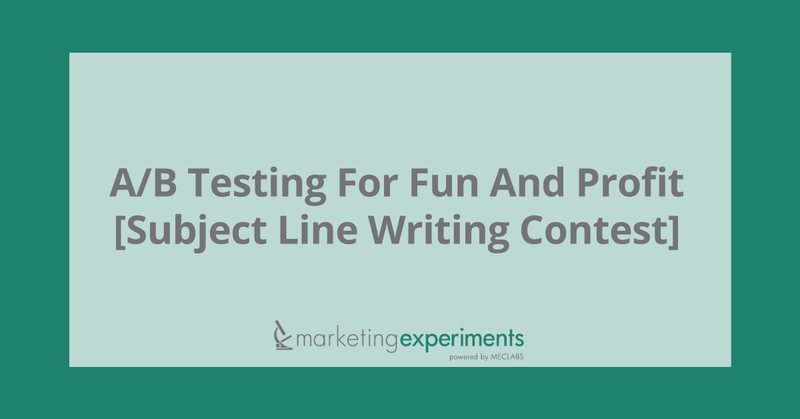 Write your best subject line, and leave it as a comment to this blog post. Easy peasy. The last day to take advantage of the Early Bird Discount ($300 off) for Email Summit 2014 tickets is January 9, 2014. If you plan to be out of the office for the holidays, be sure to book your ticket before your vacation so you don’t miss out on this special rate. MarketingSherpa Email Summit 2014 promises to provide you with a great experience and an opportunity to learn what is and isn’t working in email marketing today. All case study presentations focus on real results with practical concepts you can use to do your job better. Come learn from your peers at companies like 3M, Dell, Porsche and Whirlpool. If you want to learn how to grow your list, boost your performance and increase email ROI, join us at the Aria Resort & Casino Las Vegas on February 17 through 20, 2014, for Email Summit 2014. Order your tickets today so you don’t miss out on the Early Bird price before it expires Thursday, January 9. If you have any questions, please feel free to email me anytime at p.markey@meclabs.com. Last Chance to Save $300 on 2014’s Best Email Marketing Summit! Reserve Your Seat and Save $300 on the Best Email Summit of 2014! Don’t Miss Email Summit 2013! Save $300 with early registration! 1- Will you learn in January what companies like 3M, Dell, Porsche and Whirlpool are doing that you do not know about? 2- What companies like 3M, Dell, Porsche and Whirlpool are doing that you do not know about? 3- What your close business competitors are doing better than you are in January? 4- You can do as well as 3M, Dell, Porsche and Whirlpool but you need to know their secret… Open now before is too late! 5- 3M, Dell, Porsche and Whirlpool grow sales by doing this every time, are doing it? Need an elf to help you with email marketing? Going to Email Summit 2014? Here’s a $300 discount. But hurry – sale ends January 9. Tick Tock – Email Summit 2014 discounted registration ends soon. For this one, I can’t help but think of a subject line that states the early bird catches the holiday worm. Sherpa Saves You $300 To Summit!